Crisp aesthetics, streamlined silhouette, lightweight and in pure-white. For real metropolitan dreamers, who have their head screwed on nonetheless. Look no further than this bed frame upholstered in leather or fabric, and then clad in oak. Before going to bed we like to treat ourselves to a good book or film: you'll be comfy resting against this large headboard in tuft leather. 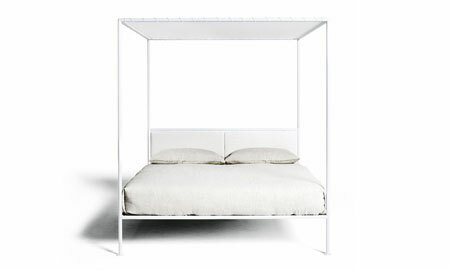 Padded headboard with built-in reading lights, platform in sycamore and linen mosquito nets. Fit for the cosmopolitan monarch! Just like our favourite fairytales, this bed is fitted with a secret chest: hide all your secret away. For modern globe trotters, this version in leather is inspired by colonial style. Anti-stress, built from seven different layers, one side is padded in camel wool and the other in pure linen (one for winter and the other for summer). This mattress in perfect even for those hardest to please.